Description: Free, public domain image: Navy Machinist Inspecting the After Burner of a F404 Jet Engine. 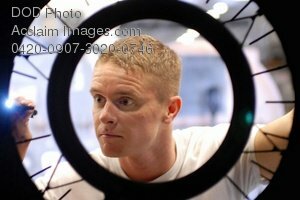 Petty Officer 2nd Class Steven Aldridge, aviation machinist mate, inspects the after burner of a F404 engine in the jet shop aboard the aircraft carrier USS Ronald Reagan. Aviation machinist's mates maintain, service, adjust and replace aircraft engines and accessories. Ronald Reagan is underway on a routine deployment in the Arabian Sea.